At Radius Bank, it’s all about virtual banking, with innovative programs and a focus on the customer experience as the primary drivers for future growth. Radius knew that a responsive website experience was the next step in capturing increasingly mobile customers, and tailored their web experience to meet the demand. The website functions as its central banking hub, and the responsive experience was designed to be uniform—for customers who conduct their business from their laptop, tablet, or mobile phone. 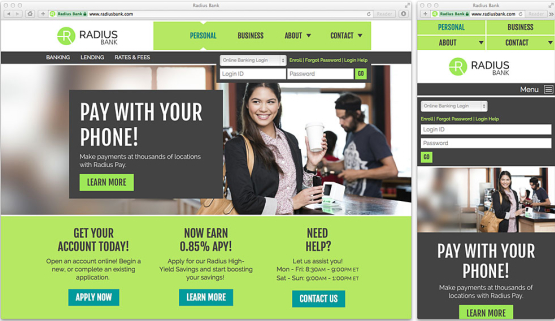 Stackpole’s design for the Radius Bank website has been recognized by industry website The Financial Brand as one of 25 Inspirational Responsive Banking Website Designs. We are proud to have had our work included on this list along with so many other great site designs and think that this is just further proof of the great work produced as a result of a constructive agency-client partnership.